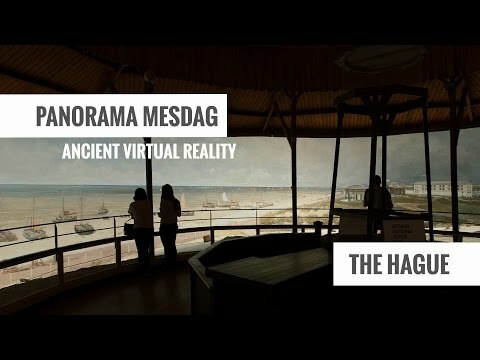 Look 360º around you and experience the magical optical illusion created by this panorama of Scheveningen from 1881 in Museum Panorama Mesdag. The view is never the same; the incidence of light is more than magnificent and changes from moment to moment. The vista of the sea, dunes and old fishermen's village Scheveningen was painted by H.W. Mesdag. Panorama Mesdag is a unique cultural historical monument. The building that incorporates this panorama was constructed specially for the painting. In the centre of the building, an artificial dune has been created on a roundabout. From a viewpoint above the dune, visitors will see the same panorama as if they were standing on the Seinpost dune levelled off in 1881, as the canvas hung around it shows an impressively painted beach and seaside scene. The entire work, which comprises the structure and panorama, was completed between 1880 and 1881. As an example of the typical 19th century "instruction and entertainment" idea, Panorama Mesdag is unique in being the last vestige of the maritime panorama in the Netherlands. The painting is important as a product of the Hague School, not only because of its size, brushstrokes and theme employed, but also as a result of the collaborating artists of the Hague School. From a cultural-historical perspective, Panorama Mesdag grandly and gloriously sets forth the tradition of the trompe l'oeil effect in a manner unsurpassed. Panorama Mesdag is open on Boxing Day (11:00 - 17:00) and New Year's Eve (10:00 - 16:00).